This question is taken from 2008 Dunman High School Prelim paper 2 question 5. 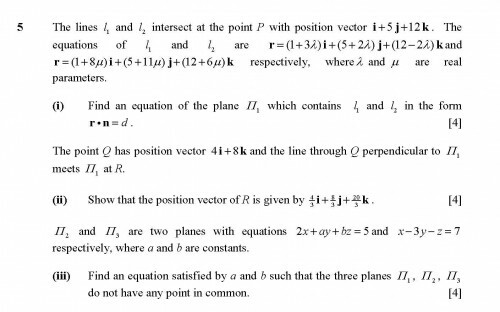 You'll need to understand that if three planes do not have a common point, then the line of intersection of two planes must be parallel to the third plane to answer part (iii) of this question. To view the boardcast on YouTube, please click on the YouTube icon at the lower right hand corner or click here.